Toynbee street is the sort of place easily missed. Just down from Spitalfields market leading towards Aldgate is a little turn off opposite the entrance to Fashion Street. The street has a number of derelict buildings on it which give an atmospheric backdrop to the street art that appears there. I’ve blogged about this street once before when it featured in the Robbie Williams video for his number one hit song ‘Candy’. In the video he walks down the street and past a paste up from A.CE. I wandered down it again today and the A.CE paste up has been painted over in purple leaving only the eyes visible. It looks strangely eerie. That particular piece is set into the doorway of an old building seemingly empty and unused. Two other pieces caught my eye set against the backdrop of these derelict buildings on what is only a short road. 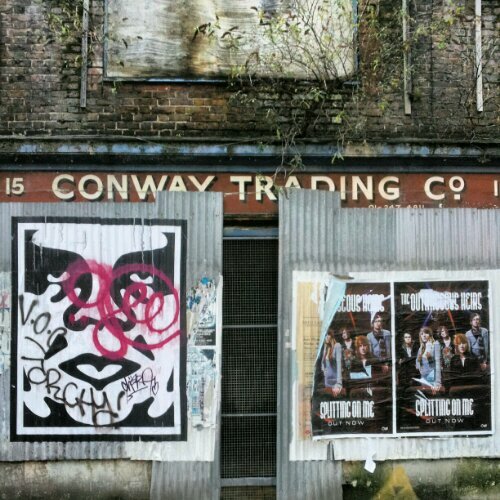 The first by Shepard Fairey is one of his many ‘Obey’ paste ups seemingly doted around with abandon over the East End. I’ve blogged about these before when he put some up on Whitechapel Road. This time the setting makes it really stand out with the old sign front of an abandoned shop just behind. 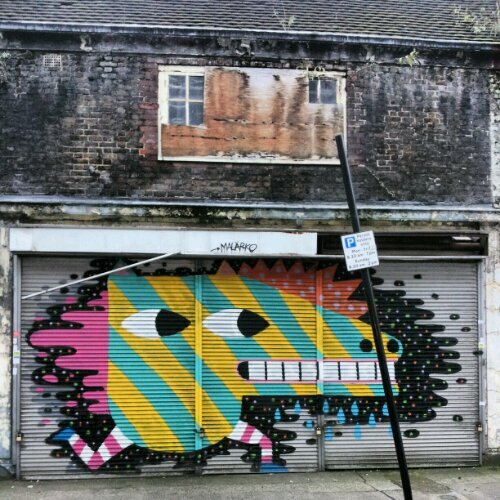 The second piece it’s from Malarky with one of his trademark characters so familiar in the area gracing a shutter front. Painted bright yellow and blue with a bit of pink it contrasts nicely with the ageing building behind and really stands out. 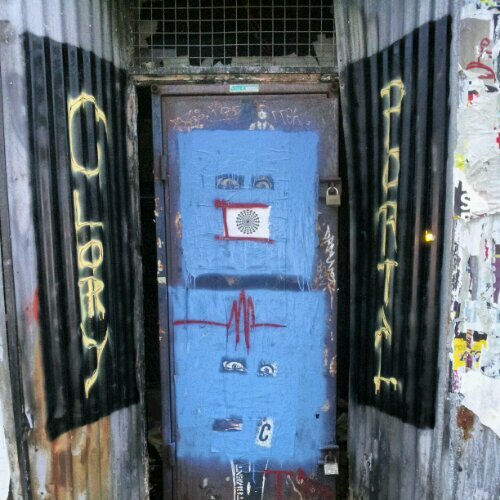 Pingback: Shutter street art pt 1: Toynbee street area London E1 | "Notice what you notice..."